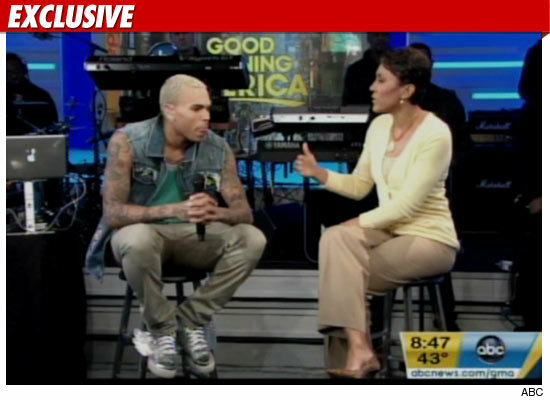 Robin Roberts asked Chris Brown if she could ask him about the Rihanna incident BEFORE the live interview began on "GMA" this morning ... this according to sources connected to the production. Sources tell TMZ ... Roberts insists both she and other "GMA" staff members spoke with Chris before the interview and asked if it would be OK to ask "a few questions" about the Rihanna incident ... and Chris approved. As TMZ first reported, Brown flipped out after the interview -- and apparently smashed a window in his dressing room. Robin is telling people at the show she did NOT try to set him up ... and insists, "I'm pulling for the guy." As for the broken window, no one in the studio saw Chris throw the chair into the window ... but he was definitely in the dressing room when the window was smashed. Honestly, I totally get why he got upset. Here you are trying to promote your new album and all the person interviewing you wants to know about is how you beat up your ex-girlfriend. I would be a little bit pissed too. That's taking away from the whole purpose of him even being on the show. I think that ppl need to pipe down and move on. What he did was wrong, he admitted and sought help and even did his time. Now it's time for us to forgive him and stop persecuting him for it. After Rihanna seems to have moved on and harbors no bad feelings toward him anymore and she was the one who got beat up! As stated by YUMMommy: "Honestly, I totally get why he got upset." But CB has got to understand that Smashing a window is NOT the answer. With that ONE angry outburst he's probably set himself back having done more damage to an already battered image that He has spent so much Time (since the Rihanna *incident*) trying to repair...SMH. Btw: Am I the only one troubled by the way he looks these days? His blonde hair, tattoos, and rather lost look in his eyes. He just seems *lost* and confused to me. However, I want to also point out that one can hardly be Black in America and NOT notice the difference of how celebs who are "BLACK and crazy" versus "WHITE and crazy" are treated by the media and generally Accepted (i.e., Charlie Sheen) or NOT accepted, by the public. IMO, both guys are stark examples of a *CRY For Help. * But I digress. IMO, at the very least, CB, needs intensive *stress AND anger management* counseling. His failure to seriously seek that kind of help will probably lead to continued problems for him. And for goodness sake DON'T do anymore interviews unless there is a CLEAR understanding of what questions he's willing (and NOT willing) to answer!